Back when I did the transition from studying software engineering to entrepreneurship, one question kept coming to me – while methodologies are inevitable for successfully building software products, why isn’t there an integrated methodology for launching and taking that product to market? Take for an example the Perpetual Beta and Spotify, a successful online peer-to-peer music streaming service. Spotify did not only use beta versions to test engineering requirements with early users – using beta-invites enabled Spotify to create demand for their service at the same time. Software developers have been embracing practices such as Continuous Deployment for years, but merely from a technical viewpoint. I believe that the Perpetual Beta represents a new line of ambidextrous practices that not only enables a startup to plan, test and build – but also serve, distribute and market their product at a lower cost. Astonishingly, methodologies that help entrepreneurs facilitate software product development alongside commercialization are still scarce. At the one hand there exist a variety of methodologies to manage risk in agile software product development, including Scrum, Extreme Programming and Adaptive Software Development. However, none or few of these methods, to my best knowledge, encapsulate risk in commercialization. To simplify, think of it as Scrum + marketing (Scrumm). At the other hand traditional management practices have been argued not to fit the extreme uncertainty in startups, and often comes to short in terms of aligning with disruption driven by Internet technologies. At that time I was also more than inspired by Crossing the Chasm that addresses the specifics of marketing disruptive high-tech products. However, I still find the Pre-chasm phase left unintended. In my last post I wrote about diagramming the product-market fit, in which I have aligned with the Technology Adoption Life Cycle below. 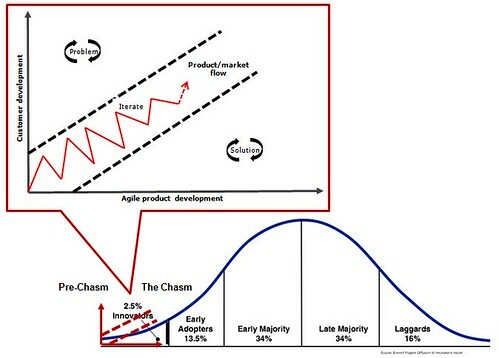 In many ways I think that new-product introduction is about ramping the Pre-chasm, where building and taking new products to market are not two separate activities. Obviously a startup needs ambidextrous qualities, and working engineering and marketing in parallel will enable a startup to discover the holy grail of product-market fit – a key tenet with Customer Development and Lean Startup thinking. Together with elaboration on 37signals’ Getting Real and Rework, I look forward to seeing what this emerging school of startup methodologies brings.